Founded in 1869 by Arthur Brook, developed his own quality blends mixing together various estate teas. This ensured a more consistent quality because, as with any crop, the characteristics of a consignment can vary according to climate, time of year and general growing conditions. In 1930 PG Tips was launched in the UK as a loose leaf tea in soft packs. It was originally called Pre-Gest-Tee” but soon abbreviated by grocers and van salesmen as PG. The company adopted the official name and added ‘tips’ to highlight that PG takes only the top two leaves and a bud to make its tea. PG Tips is a popular British blend of the finest Assam, Ceylon and Kenyan teas which produces a rich and refreshing flavor. The definitive traditional English tea. The PG Tips pyramid tea bag gives the tea leaves more room to move around than a flat conventional tea bag. So the tea bag works like a miniature tea pot. This allows for all the freshness to be released for the best tasting cup of PG. 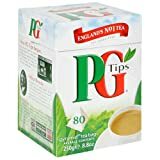 The Brits go bonkers over PG Tips–known internationally for their revitalizing, tasty and timeless black teas, PG Tips is loved the world over and nowhere more than in Britain where 35 million cups of PG Tips are consumed each day. Why is PG Tips England’s #1 tea? It’s the taste, of course. PG Tips uses only the highest quality and most flavorful top two leaves and bud off the tea plant. PG Tips flavorful black tea is harvested from the finest tips of tea plants grown in Ceylon and Kenya, providing you a quality tea with exceptional taste. All you need to do is pop the kettle on and enjoy the outstanding taste of PG Tips black tea. Arthur Brooke opens his first shop in Manchester and its success lays in his sale of reliable tea blends. His big break comes in the late 1870s when a grocer asks for a bulk order of tea at wholesale prices. Arthur Brooke launches in the UK tea market under the name of ‘Pre-Gest-Tea’. Grocers abbreviate it to PG, and the company adds ‘tips’ to highlight the fact that PG uses the top two leaves and a bud to make its tea. The makers of PG Tips introduce the tea bag to a stunned nation. They catch on quickly and soon, tea bags out-sell loose-leaf tea. The makers of PG Tips launch the revolutionary PG Tips pyramid bags. With more room inside, it acts like a miniature teapot, giving the leaves more room to move. PG Tips joins forces with the Rainforest Alliance to ensure PG Tips tea suppliers meet their high sustainability standards. Scientific studies have linked drinking tea to the maintenance of certain normal healthy body functions, such as hydration, focus, and alertness. Tea naturally contains zero calories, therefore, when it is used in place of higher calorie beverages as part of a healthy diet, it can help with weight control. In addition, regular tea drinking may help maintain cardiovascular health as part of a diet that is consistent with dietary guidelines. Research suggests that drinking 2 to 3 cups per day of black or green tea helps maintain healthy blood vessel function. NOW Non-Fat Dry Milk has a superior taste compared to commercial instant dry milk powder. Our non-instant powder has a shorter pasteurization and drying process that helps to improve flavor. NOW FOODS supplies a wide variety of natural foods, sweeteners, sprouting seeds, flours, grains, and stevia. NOW also provides full lines of vitamins, herbs, extracts, and essential oils. 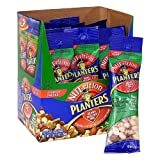 Planters Nut-rition Heart Healthy Mix is a delicious combination of lightly-salted Peanuts, Almonds, Pistachios, Pecans, and Hazelnuts. Each box contains 18, 1.5 ounce, single-serve bags. Makes a great snack! 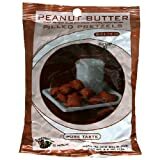 Peanut butter pretzel salted have taste both of our 100 percent natural crunchy, whole wheat pretzels filled with ultra creamy 100 percent natural peanut butter. They’re bite sized nuggets for nutritious convenience, great for lunches and other snacking on the go. Its a fully natural cholesterol free. Good health natural foods strives to provide affordable, healthier for you snack foods. GHNF produces healthy snacks such as olive and avocado oil potato chips, veggie stix and the new humbles. GHNF has developed a reputation for healthy living and creativity that has always resulted in products that are beyond ordinary. Fresh fruit is not always available for you and your family to eat. Whether people are at work, in the car, or traveling, they need to find a new alternative to get their daily fruits. Brothers-All-Natural Fruit Crisps are the 100% freeze-dried fruit snack you want to be eating to achieve that goal. We start with the most luscious fruits from the greatest growing regions in the world and bring them to our state-of-the-art freeze drying facility. At our facilities, we gently remove over 95% of the water from the fruit which transforms the fruit into a light, flavorful, crisp fruit snack. Unlike other dried fruits, Brothers-All-Natural Fruit Crisps retain all of the nutrients of the fresh fruit with absolutely no added sugar, preservatives, or dies. Our uniquely designed bags keep Brothers-All-Natural Fruit Crisps fresh for up to 1 year. Brothers-All-Natural Fruit Crisps are peanut/tree nut free, gluten free, soy free, dairy free, vegan, and OU kosher certified. A bag of Brothers-All-natural fuji apples contain approximately 1 ½ apples and only 39 calories. 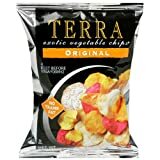 People often say there’s nothing new under the sun, and yet Terra Chips are both old-fashioned and uniquely new. Old-fashioned in the sense that people have cherished these root vegetables since before civilization began. New in those two chefs from New York City, Dana Sinkler and Alexander Dzieduszycki, have gathered this delicious variety of vegetables together and prepared them into a light, naturally colorful collection of chips. Many of these vegetables are savory, some are sweet and mixed together they achieve a satisfying balance of flavors – complex, nutty, rich, delicate. Hot cereal. A deliciously smooth, high fiber cereal milled from high protein oats grown in the great Northwest – some of the best oat-growing country in the whole United States. 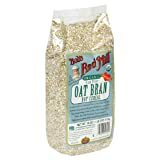 Bob’s Red Mill Oat Bran Cereal Contains a high concentration of the natural fiber found in oats. USDA organic. Certified 100% organic by QAI. All natural. Diets rich in whole grain foods and other plant foods low in total fat, saturated fat and cholesterol, may reduce the risk of heart disease and some cancers. Wouldn’t it be great if there was a natural snack that had the great taste and health benefits of fresh fruit, but the crunch and portability of everyday snacks? Now there is! Discover Funky Monkey Snacks – fruit that crunches! Funky Monkey freeze-dries slices and pieces of tropical fruits using a proprietary process to lock in the taste, smell, and nutrients of freshly-picked fruit while adding a fun and satisfying crunch. And every bag of Funky Monkey contains 1 serving of fruit! With nothing added – no added colors, flavors, preservatives, or sugars, Funky Monkey is 100% natural and 100% delicious, as well as gluten-free and certified Kosher. Discover Funky Monkey Snacks – tasty, crunchy, and convenient all-natural snacks with the wholesome goodness of fresh fruit. Iams Healthy Naturals provides outstanding nutrition with 9 key ingredients: high-quality protein from chicken and egg to help build and maintain strong muscles; carrots for healthy vision; Beta-Carotene, Vitamin E and antioxidants — including those from tomatoes and peas — to promote a strong immune system; spinach and essential vitamins and minerals for a strong and healthy heart; natural fiber from apples and beets for a healthy digestive system; fish oil and flaxseed, rich in Omega-3 fatty acids, for a healthy skin and shiny coat; wholesome grains to provide energy and vitality; and natural calcium for strong teeth and bones. 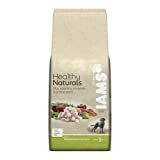 Iams Healthy Naturals Premium Dog Food with Wholesome Chicken. These guideline amounts are a starting point and your pet may need more food depending on age, activity and temperament. In order to reach optimal body condition, you may need to adjust food intake. This represents the total recommended volume of food per day. You should divide the total recommended feeding amount by the number of times you feed your pet per day to get the actual portion size per feeding. Dry/canned mix: for each 1/2 cup of dry food, you can substitute 1/4 of a can. Recommended for Adult Dogs 1 year and older. When introducing Iams Dog Food, gradually mix it with your dog’s current food over the course of four days.